In the last year, I’ve begun ordering more groceries online from Amazon. With free two-day delivery, thanks to my Amazon Prime account, it’s a quick way to restock non-perishable items. But the tedious process of searching for and selecting each item has kept me from using Amazon as a regular shopping destination. Evidently, I’m not alone in this because Amazon has just made shopping point-and-shoot simple with an update to its Amazon Mobile app. With the updated Amazon Mobile app, you can choose to visually search for items using a new option called Flow. Flow uses your smartphone’s camera to see the item you want to purchase. It looks for graphics and text and then searches for a match in the Amazon product database. Amazon has had the Flow technology available in a standalone Flow app that was designed to provide product information. The new integration of Flow into the Amazon Mobile app makes purchasing point and click simple. How well does it work? 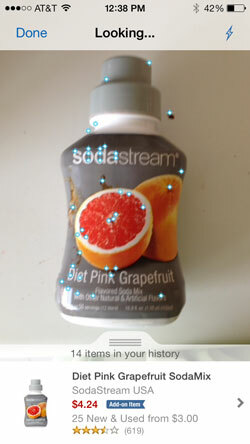 I tried the app on 20 items in my kitchen, including Morton’s Kosher Salt, Belvita Breakfast Biscuits and SodaStream Diet Pink, and found the app worked nearly every time. When the app finds a match, it shows the listing. The app usually found the best listing, but there were cases when it was off. Does anyone really need 12 three-pound boxes of Morton’s Kosher Salt? The app also finds the best deals, taking into account the shipping fees as well as the item price. But you don’t have to take the app’s word for it. You can always check all of the product options and sellers by selecting the listing. I can see Amazon Mobile being a handy way of capturing items that need replacing on an ongoing basis, rather than when you sit down to make your grocery list. And since the app saves all of your Flow image scans, you can easily go back to see what you've capture when it's time to order or re-order. The free Amazon Mobile app is available in iTunes and Google Play. I wish you would post links for android apps, not just iPhone. Love the blog! Thanks Lori! When I wrote about the feature, it was only available on the iOS version of the app. It since became available on the Android version and I forgot to update the story. Thanks for the reminder! I’ve added the link.